Volunteer pins made by Lauren Nagoda of No Line Left Behind, an advocacy group working to educate fishing enthusiasts to pick up after themselves. 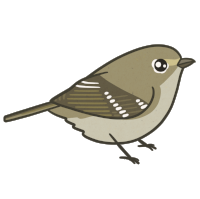 Not to be confused with a local birding spot (also known as a patch), bird patches—the sew-on kind—have been around for a while. Google “History of patches” and find the patch has its roots in the military, with a veering into various counter cultures in the 20th and 21st centuries. Is birding a counter culture? You be the judge. Birding may not historically have the same cool factor as say, Punk or Hippies, but that is changing. Of course birding is cool! Sharing with the world that you are a birder carries more meaning than simply making a fashion statement (for one, a bird patch or pin transcends fashion all together): A bird patch or pin might indicate conservation advocacy, breadth of travel, bragging rights for species seen, membership in an organization of bird lovers, political affiliation, feminist inclination, place of origin, and so on. These are conversation starters for people who already have birds in common! Yay for pins and patches! Sewing this year’s Feminist Bird Club patch on my birding field bag. Years ago, a birding guide in Italy shared his zeal for patches, and asked me to send him one from my part of the world when I returned home. So I did, from the Othello Crane Festival in Eastern Washington State, a place he had definitely never been. At the time I did think twice about his request, but mainly over concern that I had his correct mailing address, not on the ethics of wearing a patch from somewhere he’d never birded. I admit, calling it “ethics of wearing a patch from somewhere you’ve never birded” is a bit rich. If someone wants to do that, fine. But I believe there is an honor to earning the pin or patch, which leads me to my next rule. The Royal Society for the Protection of Birds (RSPB) has this one down. They sell pins EVERYWHERE in the UK, and I mean beyond nature shops. You could find a little stand or dish of pins at every kiosk or gas station (it seemed). Those pins and membership support nature preserves all over Britain, and help mainstream RSPB in that country in a way that our US bird orgs might envy. I stocked up on these pins as gifts while birding at the Minsmere Preserve, and wear one on my hat to this day. 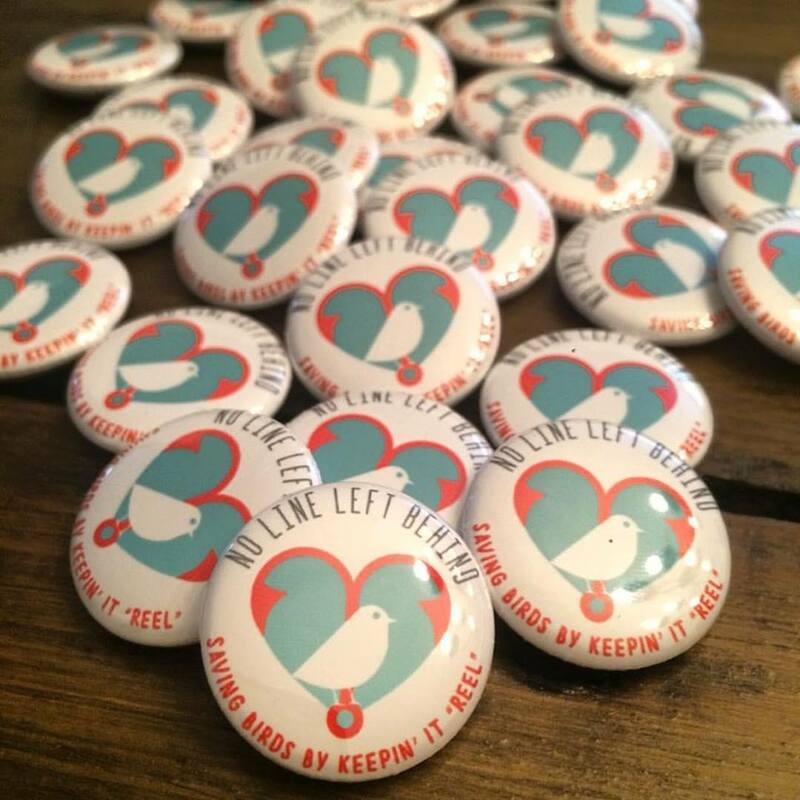 I’ve got examples in this post of other orgs producing pins or patches such as No Line Left Behind, Feminist Bird Club and Seattle Audubon. 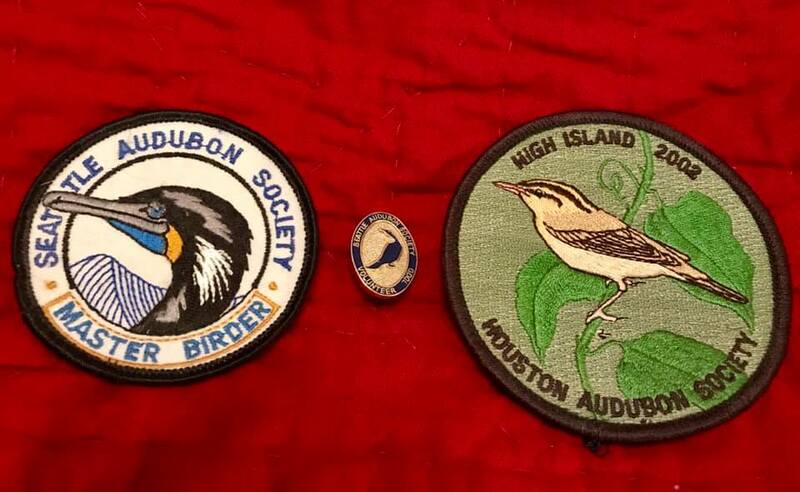 The sale and/or wearing of the pin or patch tells others you are a mission-led birder supporting bird conservation or greater representation in the birding community. The badge has got to send a message that benefits wild birds. So no, bird patches of sports teams do not count. Friend Cambria Cox’s bird pins, one an actual patch mounted on a pin back by the look of it! The Bald Eagle pin is from Glacier National Park. Molly Adams, founder of Feminist Bird Club (FBC) pin and patch collection, including 3 from FBC (bottom left). 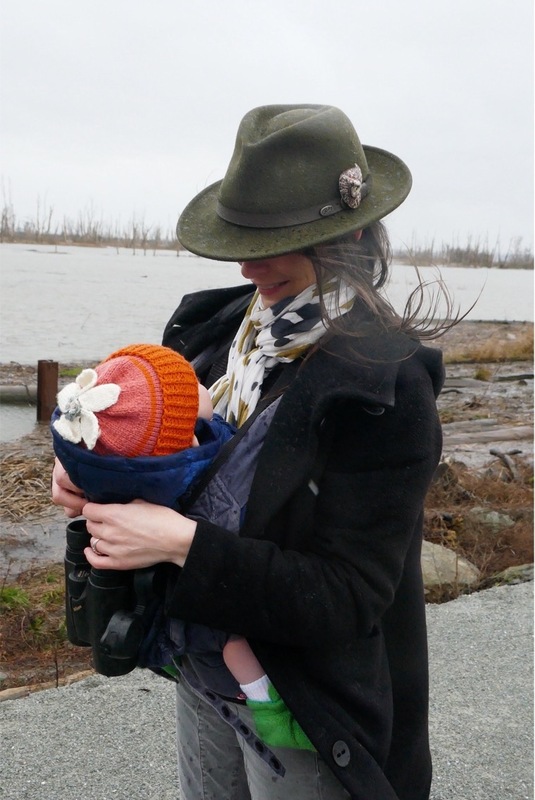 You may notice a few volunteer hours pins in this post, the most impressive one from Izzy Arevalo Wong, whose pin below shows her completion of 1000 hours for Seattle Audubon! Not only that, but she completed a two-year Master Birder program, also below. Likewise, a pin or patch from someplace far flung is equally important to wear, so long as you’ve really been there and birded. Them’s bragging rights! Izzy Arévalo Wong’s Seattle Audubon Master Birder Patch (2001), Seattle Audubon pin for 1000 hours of volunteer time, and a High Island patch, where she birded several times. That’s it from me, but what do you think? Please share your thoughts and opinions in the comments below! My hat pins: Western Screech Owl carved by my dad, Tony Angell. The Common Ringed Plover is from the Minsmere Nature Preserve gift shop, in Suffolk, UK, run by the Royal Society for the Preservation of Birds. The Seattle Audubon pin is for my completion of 100 hours of volunteer service, now far surpassed (I’m closer to 500, but nowhere near Izzy’s 1000 hours! ).